The uncertainty surrounding the upcoming February 2nd elections in Thailand centres, not on who will win, but rather on whether it will take place at all. The incumbent Prime Minister Yingluck Shinawatra retains substantial support – especially amongst rural agricultural workers, the poor and those in the North – and her Pheu Thai party seems likely to be returned to power. This result was expected even before the opposing Democrat Party declared that it would not be fielding any candidates. The decision to hold an election comes after a series of protests which have crippled the government’s capacity to function and reinforced divisions within the country. Yet the election – if it is held – will not end hostilities. The tension in Thailand has existed for a number of years and stems from the perceived political influence exerted by former Prime Minister Thaksin Shinawatra. Mr Thaksin was ousted by a military coup in 2006 and left the country to escape charges of corruption, yet he continues to be a popular figure with large swathes of the population. Since Mr Thaksin’s removal from power his sister Ms Yingluck has led the party, though many believe that most policies continue to be determined by the former Prime Minister. Urban elites look likely to only be satisfied once the family has been removed from public life entirely and protesters have called for Ms Yingluck to step down immediately. They hope to replace her government with an unelected “people’s council”. Many believe that before elections can take place there are serious reforms which need to be implemented. Another issue – and one of the perceived reasons for the Pheu Thai party’s support – is the controversial rice subsidies whereby the government guarantees a certain price for the rice. To many this is seen as a political bribe and it certainly works to that effect as Pheu Thai remains the party of choice amongst agricultural workers. It is one of a series of populist policies which have secured the momentum of the Pheu Thai party in Mr Thakin’s absence. 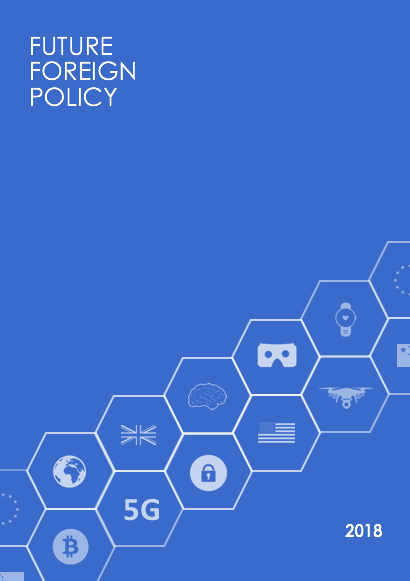 However, the policy is proving costly and some experts expect it to fail which may contribute to further instability. The most recent wave of protests began in November after the Lower House attempted to pass an Amnesty Bill, which would have allowed the disgraced former Prime Minister to return from his self-imposed exile without serving jail time. Most protesters come from the urban middle classes and are led by the former deputy of the Democrat Party, Suthep Thaugsuban. The pressure placed on the government has increased with barricades set up around and protesters entering many official buildings. Protests turned violent on November 17th and tear gas was used in an attempt to control the crowds. Yet the police seem ill-prepared to manage the full scale of the conflict. As with protests in 2008 and 2010 the economy may be badly hit, especially tourism, and as the situation looks unlikely to be resolved in the short term it may deteriorate. Over 150,000 protesters had descended on government buildings in Bangkok. On 9th December, the Prime Minister dissolved parliament and called for an election. 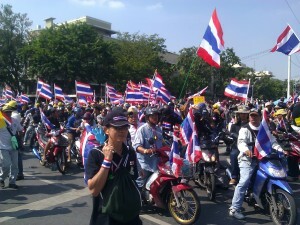 The Pheu Thai supporters – commonly known as red shirts – have mainly stayed out of the protests. Politically the intention is to limit violent clashes which would warrant a greater level of military intervention and possibly a subsequent coup. Logistically the party’s support is primarily based in rural areas far from Bangkok and conflicting internal factions have further hindered mobilisation. Yet many are united in their attitude to the protesters and the Democrat Party. They object to insinuations that they are not educated enough to participate in politics and especially that their vote has been bought. 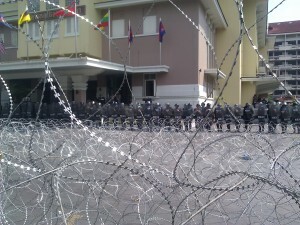 A police barricade at the Ministry of Education. Photo Source: Wikimedia Commons. Whether the election will go ahead at all is questionable as the official opposition party has refused to field candidates and the electoral commission has recommended that the election should be called off for fear of violence against candidates. On 26th December a police officer was killed and many were injured during protests to prevent parties registering. Nonetheless Ms Yingluck has rejected pressure to postpone or cancel the election; on 22nd December she asked “If we don’t hold on to the democratic system, what should we hold on to”. The government has requested aid from the army in protecting the public and politicians. Yet if the run-up proves to be as violent as it has been thus far there may be no option but to abandon the election. Even if the election does go ahead it seems unlikely to bring about any satisfactory resolutions as the pro and anti-Thaksin Shinawatra factions are too deeply entrenched. If Pheu Thai are returned to government any unhappy with the result will reject the legitimacy of their mandate. Conversely their supporters will continue to, quite rightly, say that they make up the majority and therefore democracy should be upheld and Pheu Thai should remain in power. Signs of compromise also seem unlikely. The protesters have repeatedly rejected offers from Ms Yingluck to create a reform council to run alongside her government and instigate some of the changes they are seeking. Neither side will accept anything less than the success of their own party, and as such the upcoming election will by no means end the conflict in Thailand.